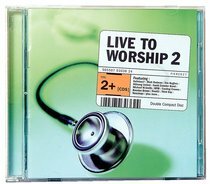 Following the success of LIVE TO WORSHIP, LIVE TO WORSHIP 2 picks up the baton and presses on with a compilation of thirty of the finest contemporary worship tracks around today. With established names sitting alongside well-known church worship songs, this double CD promises to be an indispensable release for anyone hungry for a soundtrack that goes a little deeper. Contributors include David Crowder Band, Michael W Smith, Newsboys, Casting Crowns and Third Day. The Australians put up a good defence with Hillsong United while the UK finds itself represented by Graham Kendrick, Delirious?, Matt Redman and Tim Hughes amongst others. About "Live to Worship Volume 2 (2 Cds)"